Bath House Etiquette emerged from the cult edits label Secret Mixes Fixes. Secret Mixes Fixes focuses on diverse selection of music towards the larger goal of recontextualizing music that inspired a whole midwestern sound. Bath House Etiquette showcases master editor Gay Marvine's burning Disco side, his journey through the pleasures and perils of gay nightlife. How do I look in control in only a towel? What do you do with a young lover that is beautiful to look at but trecherous to converse with? Where are all the red hanky bottoms? Best timing for a popper? The right leather harness for your body shape? What do you do when you go to leather party but everybody is dressed up as puppies sniffing each others asses? More than a myth, Gay Marvine (aka Chuck Hampton) is a life long fan of great music, great dance music especially. Having been a skilled DJ for decades (studying the greats and becoming one) gives Gay Marvine a unique perspective into music. Being of Midwestern blood he hears and feels the music in a direct way and shapes everything he touches into the sound of the early cutting-edge Detroit DJs and the music they played, reimagined with the technology available today. With the world at his digital finger tips he can take the raw essence of even the most overheard radio mix of a song and emerge with raw hypnotizing juice. 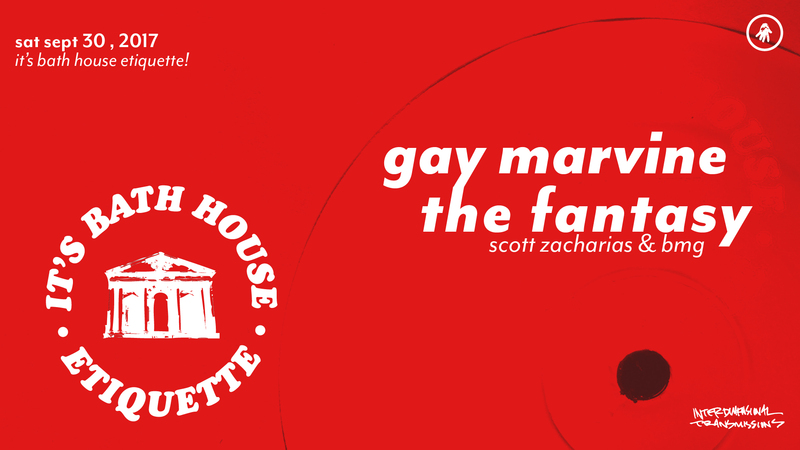 His records are edits and recontextualizations, but just as records are physical relics of a bigger movement or thought, Gay Marvine's records are totems of what DJs actually do in their sets, somehow a document of how a DJ hears music and what a DJ does. Look out for his records on Bath House Etiquette.